Cree has introduced the XLamp XB-H LED, the brightest discrete in Cree's high-density (HD) class of LEDs, delivering a breakthrough combination of lumen output and efficacy in a small package. The XB-H LED brings the lighting-class performance of the XP-G2 LED into a package that is 50 percent smaller. 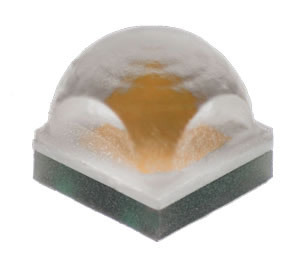 Delivering more than 500 lumens at 1.5 A, 25º C in a 2.45 x 2.45-mm package, the Cree® XB-H LED can enable luminaires that use the same-size-footprint XB-D LED to triple their light output at the same efficacy. The XB-H joins the XQ-E in the family of HD-class discrete LEDs that offer the industry's highest optical control factor (OCF), a measurement of how LED size and performance benefit directional lighting applications. High-OCF LEDs enable lighting manufacturers to improve the performance of any lighting design, create smaller and less-expensive systems, and develop new lighting solutions that were previously not possible. "Cree is the first LED manufacturer to bring this level of performance to such a small size," said Roger Suen, supply chain management director, Light Engine Ltd. "With a high optical control factor, the XB-H LEDs enable new levels of brightness and optical control to improve design flexibility, increase performance and lower system cost without sacrificing reliability." Utilizing Cree's proven and highly reliable ceramic-package technology, the new XB-H LED delivers long L70 lifetimes at both high temperature and current. In addition, the XB-H offers compatibility with most optics designed for the Cree XP family of LEDs, allowing lighting manufacturers to leverage the optics of existing lighting designs and improve time-to-market. "We are excited to offer our breakthrough high-density performance to manufacturers who prefer to work with discrete LEDs," said Dave Emerson, vice president and general manager for Cree LEDs. "Delivering up to 175 lumens-per-watt efficacy at 1 W, 25º C in its small package, the XB-H LED sets a new performance standard for high-power LEDs. Our new HD class of discrete LEDs demonstrates Cree's commitment to offering customers the best options for their applications." To improve time-to-market, lighting manufacturers seeking ENERGY STAR® qualification can take advantage of the XB-H LED's successor status to the XP-G2 LED meaning that ENERGY STAR qualification can be achieved using just 3,000 hours of LM-80 data, instead of the normal 6,000 hours. The XLamp XB-H LED is available in colour temperatures ranging from 2700 K to 8300 K and CRI options of 70, 80, 85 and 90. Binned at 700 mA, 85° C, the XB-H LED delivers up to 499 lumens at 5 W, 85° C.
Click here for more information or buy from Anglia Live.